• Identify a set of callers without cluttering your Address Book. A Lookup File can also specify a telephone device for dialing (v1.4.33 or later). For example, you can have phone numbers beginning with prefix “07” dial using your cell phone by specifying a lookup entry with number “07” and action “dial:” followed by the name of the desired telephone device. There is a local "Phone Amego Lookup File.csv" stored on your computer, and an optional remote file identified by a web URL. Both files use the same 3 column CSV format (Comma Separated Values). The three columns are labelled: Phone Number, Display Name, and Action. CSV files can be opened or exported by most spreadsheet or database programs, and are easily edited using a simple text editor (like Apple's TextEdit). Whitelist Only will block all callers not found in your Lookup File or CRM (Apple Contacts, Daylite, or Phone Amego Contact Cards). Calls are declined after a short delay so you can still see the caller ID and pickup if needed. Imagine you have a FileMaker Pro or Bento database of employees. With Phone Amego Lookup Files, you can export your employee names and phone numbers as a CSV file, edit them in Excel or Numbers, and then share them with other users via Dropbox or Apple's built-in Web Sharing. You can add callers to your local lookup file as calls arrive or from the Call Log. If you receive an unwanted call for example, you can use the Action menu at the lower right of the Call Status window (or Call Log) to select "Lookup File -> Block". Block will tell Phone Amego to Decline or Hang Up subsequent calls from this number and caller ID name (if present). Ignore is similar but also prevents the call from being logged. 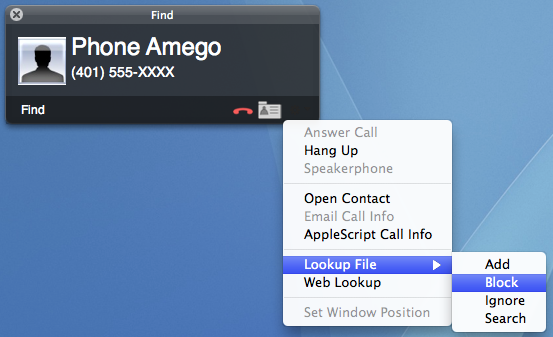 Add causes Phone Amego to add the corresponding caller ID to the Lookup File (replacing any previous information). Search retrieves the saved name (if any) for the phone number currently shown. You can use a partial phone number or prefix like "900" to block all calls from 900 numbers. An easy way to ensure the prefix matches the caller ID string received is to block a call as it arrives, and then edit the lookup file to remove any digits after the desired prefix. Pressing the Show in Finder button will show the lookup file making it easy to open in your preferred program. To share your "On My Mac Lookup File" using Dropbox, move the file located at ~/Library/Application Support/Phone Amego/Phone Amego Lookup File.csv to your Dropbox folder, and then create a Finder Alias to the file in your Dropbox at the location above. As you add phone numbers to the lookup file, they will be automatically updated on other computers connected to the same Dropbox.